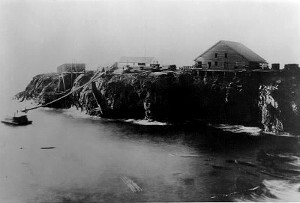 The first sawmill in Mendocino county, which appears as the large barn-like building in the photograph pictured above, was built on the Mendocino Headlands above Mendocino Bay where the mouth of Big River meets the sea. Reaching from the river’s mouth to 800 foot elevation inland ridges, the Big River wetland property includes a wide range of habitats. State lands surround it on three sides. On the north it adjoins Jackson Demonstration State Forest and Mendocino Woodlands State Park. Big River is protected and is the only major undeveloped navigable estuary remaining in Northern California. Unlike the undeveloped portions of other rivers, Big River is accessible. Big River is a place of gentle tidal flows, mist-laden redwoods, and tucked-away marshes. It is home to an amazing array of wildlife, and it has a history as a resource and a respite for humans as well. Big River today is the longest undeveloped estuary in northern California. It has 1,500 acres of wetlands, including brackish, freshwater, saltwater, and fresh emergent marshes, with 60,000 acres of connected wildlife habitat between this and adjacent public land, and over 100 miles of joined trails. There is the 60 acre Laguna Marsh, and unusual inland and extensive fresh emergent wetland representing one of the most productive habitats on earth. 50 miles of Big River and its tributaries are home to Dungeness and shore crab, freshwater mussels, ghost shrimp, river otter, beaver, harbor seals, and over 22 fish species, and 27 sensitive plant species, identified on Big River property quadrangles, and which are likely to be positively identified in future surveys. There is a high diversity of plant communities, and at least 32 mammals and over 130 bird species recorded to date. The history of Big River is the site of the earliest logging camps and dams in Mendocino county. Before the first dams were built in seasons when there was sufficient water, harvested logs could be floated down stream to enclosures at the mouth of Big River, called booms. Sometimes logs broke loose from the enclosure and floated out to sea. Eventually dams were constructed to artificially raise water levels in drier season. It has been stated that there were more logging dams on Big River than on any other stream on the Redwood Coast. All evidence to date confirms the existence of 27 permanent type dams. Twenty-two can be verified from remaining physical evidence. The first dam on Big River was 11 miles from the saw mill, and the furthest dam was 48 miles. Basically there were three types of dams. The splash dam, sometimes called an upright dam, was the smallest. It was constructed to with a minimal amount of material and was used to provide water for the logs that have been placed in the stream down river from the dam. The crib dam and the frame dam or a combination of both was larger, more permanent structures. One of these dams used over a million board feet in its construction. A dam that left no remains was called a cutaway and was used only once. All of these dams had but one purpose-to get logs down the river. Here is a list and name of the dams on Big River. The dams, which were major threats to aquatic wildlife, are gone. The last log drive and operation of the dams was in 1937; the result was a log jam (Jackson 104). Some dams fell into ruin over time, although there is lingering evidence of their presence. The California Department of Fish and Game called for the destruction of others in order to allow for the migration of fish. 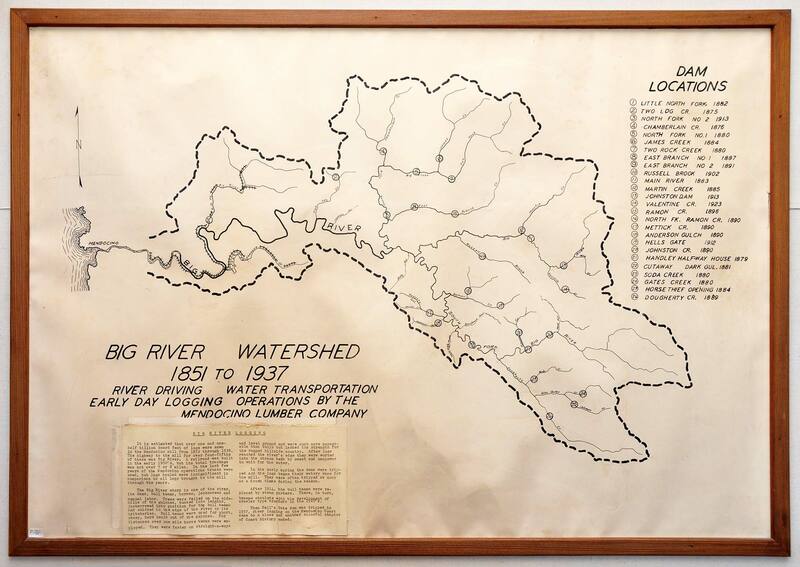 This entry was posted in Mendocino History and tagged Big river, big river tributaries, daming of big river, dams, first sawmill in mendocino, Jackson Demonstration State Forest, logging camps, logging dams, Mendocino, Mendocino county, Mendocino Headlands, Mendocino Woodlands State Park, northern California, state lands, wetlands.